Sir, TK - 27451 Reports as ordered. joby619 replied to lantern27451's topic in Newly Approved Members - Sound Off! Congrats trooper! I recently finished my anovos stunt as well. joby619 posted a topic in Newly Approved Members - Sound Off! It’s been a long journey and I know it’s only just begun. Thanks to everyone who contributed to my build thread and to everyone who participates is this community. I found great value reading through various threads and how tos. 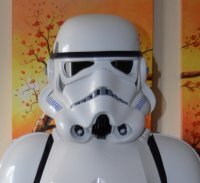 My journey to the 501st began in December 2016 when I ordered my Anovos OT kit. I received my kit in January 2018 and immediately began building. A fellow garrison member commented that I completed my build quickly, but it actually took me well over 100 hours. I stopped counting when I realized I had reached that bench mark. My family didn’t recognize me when I finally emerged from the garage and I had grown a beard in the process. I was frustrated at times and often asked myself, “why am I doing this?” All my frustrations disappeared when I first put on my completed armor. I am currently working on a Disney blaster conversion, but am itching to start a new armor build. This hobby is addicting! 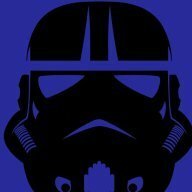 I am looking forward to my first troop and to finding my next project. Thanks again everyone. Thanks for the input. I will try trooping in it with the overlap and see how it goes. I finished the first phase of my disney blaster this weekend so I could use it for my action shot. Paint was a rush job and I just used whatever I had laying around the garage. Going to resand, repaint and weather after I upgrade the scope. I am planning on taking my submission photos tomorrow after work. I ended up buying a snap press to make my line 24 snaps. I could not get a single one to work without the press. Thanks for the feedback. I think I’ll try adding some foam in the biceps to fill in the gaps. I do want to leave some room for expansion lol and I need to foam up a couple of other areas. Please keep the feedback coming. I can say thank you enough for putting out such an easy to follow guide! I would not have been able to do this build without it. Thanks again for the tips and feedback given on this thread! Thanks so much for the feedback. I definitely need to secure my thigh ammo pack. The ab kidney overlap has to stay cuz I’m just too skinny there. I’ll try to push the belt lower back there. I would have to trim all the return edge to make the bicep smaller, but I do think it would look better if I did. It was the first time I suited up and it felt awesome. Any recommendations before I take submission photos? I believe I have completed my build and only have a couple of issues remaining. After riveting on the ammo belt to the TKittell belt, one of the snaps won't stay snapped to the ab plate. Today will be the first attempt to try on the full suit so I am hoping that there will be minimal fine tuning required. I currently have nomex flight gloves with the Anovos plastic hand guards, but will upgrade to rubber gloves and latex depending on the feedback I receive when I apply for basic. I would like to go Centurion if possible, but currently only have a disney blaster with kit that still needs to be assembled and painted. 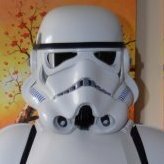 I was looking at possibly getting the blaster-master e11 kit from eBay since there is a 10% off coupon today, but there is not much info on his kit on this forum. I am planning on posting some pre-submission photos here after work today or tomorrow. Progress Report for thermal detonator and belt: I ordered these screws to use on my thermal detonator from home depot online since they did not have anything in store. I cut about 3/8" off my TD and tapered the edges. I was planning on using the boiling water method, but after tapering the edges the end caps slid right on and I could not remove them. I could not use my magnets since the end caps were stuck on so I went with just taping the crap out of them. While the TD glue and black screw paint were drying I decided to take on the belt. Again I used Ukswrath Anovos build as my guide so not many in progress pics of the belt. The most difficult part of the belt for me was making holes in the TKittell belt. That thing is solid. I ended up having to use my soldering iron to puncture it. This next pic shows the s-poppers installed thru the torso again using measurements from Ukswrath build thread. I also used the pencil lead on the s-poppers to mark the belt hole locations. I believe all I have left are the shoulder covers and holster. I figured since I had to add the extra teeth, I might as well touch up the others. I think my extra teeth are a tad bit small, but I really don’t like painting at all!